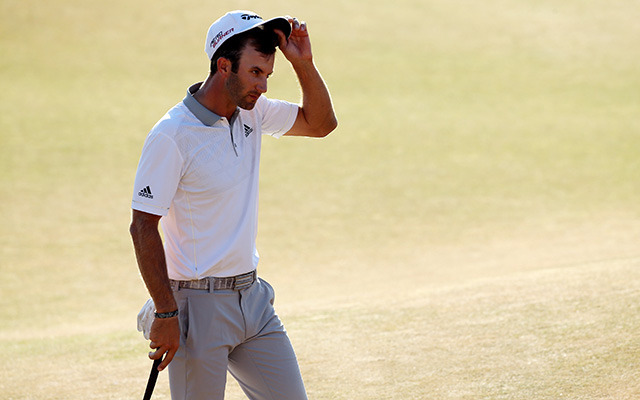 A three-putt from 15 feet was the latest moment of heartbreak for Dustin Johnson at the US Open. Dustin Johnson came to the par-5 18th hole needing an eagle to win the US Open or a birdie to force an 18-hole playoff on Monday with Jordan Spieth. After a monstrous drive and perfect 5-iron into the green to about 15 feet, those seemed like the only options. But this is Dustin Johnson at a major. Johnson, to his credit, went for the win and made sure his eagle putt got to the hole. The problem was, he blew it by the hole by four feet. Jason Day, his playing partner, had just made the same putt, but Johnson could not have been watching too intently while he prepared for his eagle putt to win. Johnson tugged the birdie bid to the right, giving Jordan Spieth the outright win for his second consecutive major. The first thing to come to mind after Johnson's three-putt was the 2010 PGA Championship at Whistling Straits. 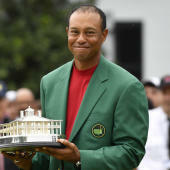 Johnson famously missed out on the three-hole playoff because he got hit with a two-stroke penalty after he finished when it was revealed he ground his club in a "bunker" on 18. This week, Johnson had done everything right. He hit 18 consecutive fairways between his third and fourth rounds. He was averaging 329 yards per drive while doing that. In the final round, he threw darts at flags early and then again late when he needed them. He didn't make enough putts early, but he put himself in the right position late. This was supposed to be his redemption. This was supposed to be his moment to erase all of the demons. The theater at 18 at Chambers Bay was the perfect setting for a storybook ending. However, the golf gods had other plans for Johnson, and his failure played out on the big stage once again. Johnson, once again, found heartbreak when he went digging for glory on the 72nd hole of a major. Johnson did not go to the media tent after the round, but some reporters did catch up with him before he left the course. Johnson talked openly about the three-putt on 18 and his round as a whole. "I did everything I was supposed to do. I hit the ball really well. I'm proud of the way I handled myself and the way I played. I really struggled getting it in the hole today. I'm proud of the way I played, and I'm most proud of my family. I did get to hold up my trophy at the end of the day, which is my son"
For more golf news, rumors and analysis, follow @KylePorterCBS on Twitter and link up with CBS Sports Golf on Facebook and Google+.